A Trip by any other name – would be just as hallucinogenic. Well, someone was tripping when they made this. A TRIP TO THE MOON was directed and co-written by Frenchman Georges Méliès, the innovator who took the “moving pictures” to the next level during the birth of cinema. Arguably the first science fiction movie, one of the first to use special effects, one of the first over 90 seconds long, one of the first to use dissolves, animation, hand-coloring the black and white filmstock, and definitely the first to cause head trips. A group of astronomers all dressed inexplicably like wizards gather together and plan a trip to the Moon. I get it: they really were wizards cos the only way to get to the Moon is by magic. Even more inexplicably, they change into professorial suits – and wind up looking like the Seven Dwarfs. They don’t forget to take their umbrellas, just in case it rains in space, of course. Onto the Moon – and the iconic shot of the spacecraft splatting in the eye of the Moon’s face. On the Moon, the scientists (dare I call them that when they’re scamping about the Moon with no helmets or atmosphere suits?) view an Earth-rise. Hmmm, very perceptive of Méliès to think outside the box of Earth – but, as Spock might say, highly illogical, captain. Y’see, only one hemisphere of the Moon ever faces Earth (due to tidal locking), so to a person on the Moon, the Earth doesn’t move at all (except for a microscopic movement due to libration – the slight oscillation from side to side of the Moon relative to Earth). Then it gets really scientific. The travelers sleep on the Moon surface (quite comfortably considering there’s no air) and are visited by the Big Dipper star cluster, Jupiter and Venus; upon waking they endure a snowstorm (! ), and take shelter in the bowels of the Moon, where they encounter giant mushrooms – which explains everything! – and are accosted by highly acrobatic Moon men (a cross between Sleestak and SOUTH PARK’s Crab People). Luckily the Moon people explode on impact with umbrellas. (We knew umbrellas were integral to space travel!) Yet our explorers are overwhelmed and captured. The one mistake the Moon people make is shackling the explorers with their umbrellas – after knowing what havoc those batwinged things could wreak. Sure enough, the scientists escape through overacting and umbrella-ing, and fly back to Earth by tipping their capsule off the “edge of the Moon” (Pure Science!) and falling down down down through space and splashing down into an Earth ocean (which looks suspiciously like a fish tank with painted jellyfish and real axolotls). 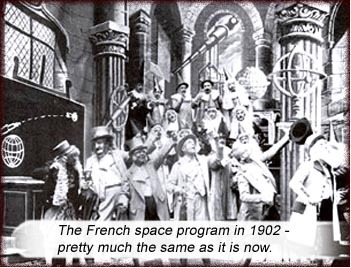 Based loosely – veeery loosely – on From the Earth to the Moon by Jules Verne and The First Men in the Moon by H. G. Wells, A TRIP TO THE MOON retains its high rating because, well, probably because Méliès was also high – uh, and such a filmic pioneer. We don’t quite know whether this was meant to be action-adventure or broad comedy (ALL the melodramatic acting back then looked like broad comedy), but whatever it is, it’s hilarious. In a simple, innocent, unsophisticated way. Back when films were being born, this black and white silent film uses no title cards, no closeups or character studies, no irony or social commentary (except maybe that wizards have the best drugs). A TRIP TO THE MOON is a farce, a frolic, a jape; action piled on adventure piled on ‘shroom visions; it doesn’t even make any attempt at science, you know, like ARMAGEDDON doesn’t make any attempt at science. Only this movie is better. Various versions exist (some with an epilogue of the triumphant return to Earth) with various soundtracks. This is a clean visual version with clear audio. aka: LE VOYAGE DANS LA LUNA. Writers: Georges Méliès, Victor André, Bleuette Bernon. Starring: Victor André, Bleuette Bernon, Brunnet, Jeanne d’Alcy, Henri Delannoy, Depierre, Farjaut, Kelm, Georges Méliès.